In these posts, I often talk about misperceptions, misinformation, and misguided notions about blindness or blindness related issues. Today’s topic is the life expectancy of a guide dog. I got my first Seeing Eye ® dog, Mindy, in 1982. Since then, I’ve worked with 4 more. Dora is my fifth Seeing Eye. I’m always surprised when a person engaged in conversation about my guide dog is confused about why I’ve had so many. Why didn’t I just keep the first one, they want to know. My sarcastic self wants to say, “think about it. If my first guide dog was 2 when I got her in 1982, she would now be 35 YEARS OLD. Dogs do not live to be 35. I must admit that the people who are surprised by this fact are not dog people. Most people who have dogs as part of their family understand that dogs do not live as long as people do. In fact, one of the saddest truths about being a dog guide handler is that it’s pretty certain that you will outlive your dog. My first Dog lived to be 11. She died as a result of surgery that should not have been performed on such an elderly dog. My second dog, Sherry, became gravely ill, at age 13, suddenly, and I had to put her down that night. My third dog, Pippen, is still living and thriving as a retired dog guide. 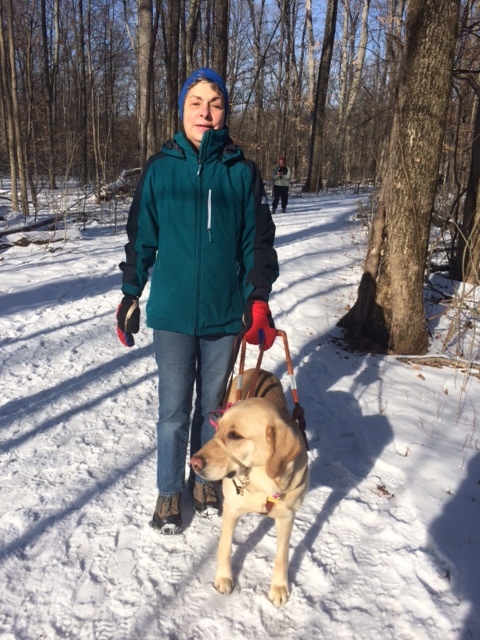 When I get to this part of the story, the uninformed person wonders, “If she is still living, why isn’t she still working as a guide dog?” Pippen is now 13. That’s like saying, “So what if you’re 100 years old. Why aren’t you still working?” Dogs, like people, get old and tired. For those of you who knew Pippen, you’ll be glad to know that she is loving her retirement. She lives with a family out in the country, where she can sniff around in the woods and lie in the garden in the sun or curl up by the fire in the house. My 4th dog, Cisco, was with me only 6 months, and then he returned to The Seeing Eye to be matched with a person with different needs from mine. So that brings us to my darling Dora, who is now 2-1/2. I suspect we’ll be together for at least another 8 years. Depending on my health and stamina, she might be my last, but I can’t dwell on that right now. When I went to The Seeing Eye for my first dog, when I was 37, and I met people who were getting their 5th or 6th dog, I thought, “Wow, they must really be old.” And now here I am. Where did those last 33 years go? BTW, Dora and I came home from The Seeing Eye 1 year ago today. Funny, we had exactly the same weather, freezing cold and piles of snow. She learned in Morristown, NJ, how to guide me in snow and ice, but now, she’s a real expert. Each dog I’ve had provided me with individual and specific memories. Mindy was the most serious one. I had to teach her how to play in the backyard. She liked to collect shoes. She never tore them up, just hid them behind the chair in the living room. Sherry was my chewer. There’s a little spot in my carpet at the foot of the stairs, which I cover up with a throw rug. But each time the rug gets scooted over, I see that little hole that Sherry left for me. Pippen was my happiest girl. She is a cuddler, and she hated walking in the rain. If we would step outside the front door, and we discovered it was raining outside, she would turn around and face the front door, as if to say, “I’m not going. Take your own self for a walk.” Cisco was a magestic looking golden retriever, tall and lanky. Because of his size, you might think he would drag me down the street, but in fact, I had to drag him. His singular joy was to run figure 8’s in the back yard. And now Dora, my little charger, will keep me young forever, or for as long as we both shall live. On Tuesday evening, 6 of us from TTN, The Transitions Network, gathered at a dining room table to talk about what we had written recently. We are the Writers Peer Group within TTN. One woman is compiling a book of stories from people suffering with mental illness in order to “stop the stygma.” Another has joined a memoire-writing group at her church. Another shared her sadness in downsizing her belongings in preparation for a move. She had already written about it on FaceBook, but she read it to us. One wrote her “bucket list” in poem form, and one had been writing letters she’d been meaning to do for some time. After we shared what we’d been up to over the past month, writing-wise, we ended the meeting with writing from a prompt. The question this night was, “What would history say about our times that we are living in now?” I dashed off a few lines, imagining what a SOCIOLOGIST MIGHT SAY, because it’s something I’ve been giving some thought to. The response from the other women was astounding. They all agreed that it is so unlike my writing and they insisted that I should post it here. So here it is, in unedited form. In the early 21st century, the people on Earth fell in love with their technology. Their gadgets changed their social behavior. Their use of language became obsolete. They returned to using pictures and symbols instead of words. They thought they were improving communication, but in truth, they lost the ability to communicate. They used their technology, not to improve the world, but to destroy the world. They began with destroying the individual lives of people they didn’t even know, and then it accelerated to destroying nations. After the destruction of civilization as they knew it, the dominant computer created a world of robots. It wasn’t what God had intended, and so God became obsolete as well. And that was not good. I had just completed the application for Ski for Light, 2015, to be held in Grandby Colorado. My finger was resting on the submit button, just lightly, ready to press, but hesitating for one more minute to be absolutely sure. It was going to cost a lot of money. I wasn’t sure my back pain would allow me to ski. What if I would not be able to get up quickly when I fell? What if the altitude would make me sick? What if the airfare would be ridiculously high? What if I didn’t have the energy to ski anymore, since I had not been skiing in 3 years? Then I did it. I hit submit. I was commited. Last week, as I glided alongside my guide on the perfectly groomed trails of Snow Mountain Ranch, under a brilliant sun in a perfectly blue sky, I was keenly aware that for the first time in years, I could think to myself, “I am happy.” In fact, I kept remarking to my guide, Betty, that I was so happy. It truly was a Rocky Mountain High. One night after dinner, our entertainment was provided by Jim Sailstrum, a well known folk singer in the area, and the song he sang that clutched my heart and brought tears to my eyes was Rocky Mountain High. That’s what Ski for Lightis all about. My third SFL was in1989 in Bozman, Montana. One of the first time guides, Betty, was assigned to be my guide. We loved skiing together and found that we had a lot in common, and we chattered along gayly as we climbed hills and skied across the meadows. My confidence in Betty’s guiding ability was boosted by knowing that she was a PE teacher of children with disabilities. Over the past 26 years, we’ve kept in touch, seen each other at subsequent SFL weeks, and hiked together at the last several Hen Hikes. When they announced the guide matches at the first meal together last Sunday night, we stood in amazement that here we were, 26 years later, sking together again. Who knew? Who could ever predict that we would still be at it at our age, and loving it? I was so glad I pressed that submit button. Did my back hurt? Yes, but I pushed through the pain. Did I fall? Of course, but I amazed myself by being able to pop right back up. Did I run out of energy? I had enough to ski 50 kilometers in 6 days. Did I dance the night away like I used to? Sadly, I’m afraid those days are over. I have other stories to tell about this year’s wonderful SFL, but I think you get the idea that I discovered that illusive state, happiness, which is still warming my soul.